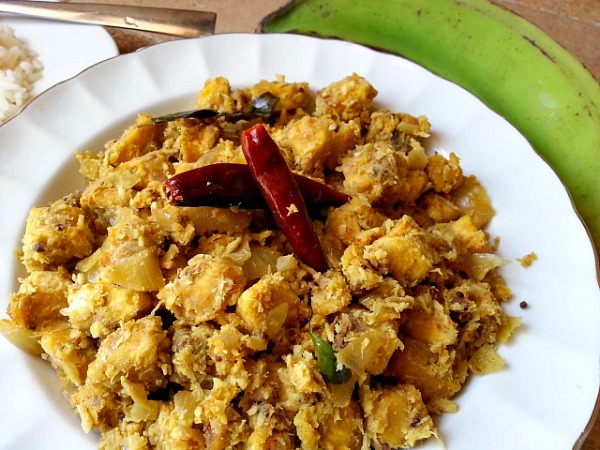 Wondering what the word “Bhaji” (Baja-gi) in Green Plantain Bhaji means. Well I was trying to link it to Wikipedia so it would be easier but the Bhaji that was described was totally different then I expected. It was what we call Bhajia, which are deep fired fritter made with garbanzo bean flour, onions, spices, baking soda and chopped cilantro. So I would not be wrong in saying that it is a common slang in Goa and some parts of Indian that “Bhaji” (mind you J is not pronounced as H in Indian) means cooked vegetables. Green Plantains is not a typical Goan dish but is cooked quite a bit in the north part of Goa and since I grew up in the south it was not common. I got introduced to plantains by my husband as his mum is from the state of Kerala where plantains are consumed the most. Kerala is a coastal state just like Goa and is down south. On a side note, it is believed that St Thomas landed in Kerala and just like Goa has a huge Christian population which is mostly made of Orthodox Christians and you wont believe… a very tiny percent of Jews who still have a synagogue in Kochi. Apart from the Portuguese who landed first in Kerala then followed by the Dutch and English. It also has the highest Literacy Rate in India. When I cooked the Green Plantains, I realized that they are a good substitute for potatoes. It does not have a lot of flavor and is very dry and waxy to taste. Also since it has more resistant starches, it makes for a lower GI food. You can check the following article. 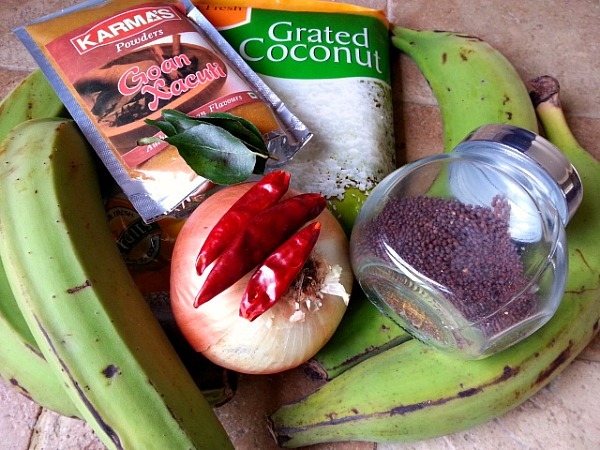 Steam the 4 green plantains on medium heat for 25 minutes. Let cool, then skin it and dice the plantains. Heat oil in a pan. Add the mustard seeds, red chillies and half the curry leaves. Be careful as the mustard seeds tend to splatter, cover the pan for 30 seconds till the popping sound is over. Next add the xacuti masala and saute for 1 minute. To this add the water and salt to taste, cook covered for 2-3 minutes on medium heat. Add the chopped plantains, mix well and check for seasoning. Again cover and cook for 5 minutes. Next add the grated coconut, curry leaves and stir. Cook covered for another 3-5 minutes till done. 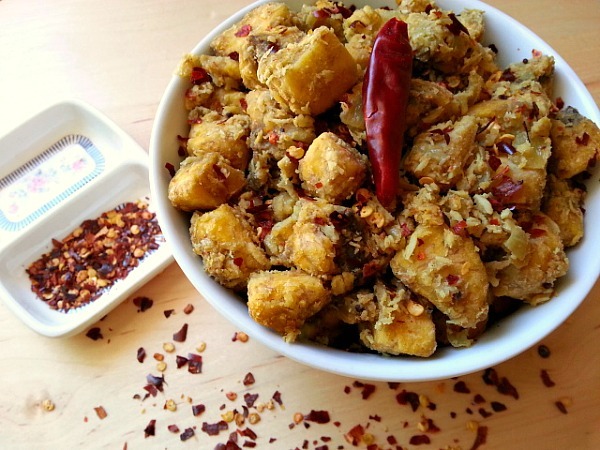 Serve this Green Plantain Bhaji as a savory side with rice or bread. It is vegetarian and vegan friendly. Not a fan of Green Plantains then try out my Green Beans Recipe. I finally got around to preparing this. It’s really amazing. Looks amazing but I am ashamed to say I have never eaten Plantain, will keep an eye out for it in the fruit and veg shops. Beautifully prepared… I’m just starting dinner here in California and I wish I had the ingredients on hand to make these plantains!! Nandini, I love your blog and I have nominated you for the Leibster award.Should you choose to participate, there are some guidleines on my blog at debbiesjourneytohealthandhope Good luck. I have always wondered what people do with plantains. Now I know and it sure looks good! This dish sounds delicious – I love plantains in all forms – be it green and used like potatoes, or ripe ones for delicious desserts! Hello my friend:) Always deliscious food on your blog 🙂 How have you been. Nandini, you have no idea how helpful this is, as my husband’s favorite fruits are banana and plantain and we always have green plantains hanging around for days until they ripen!!! 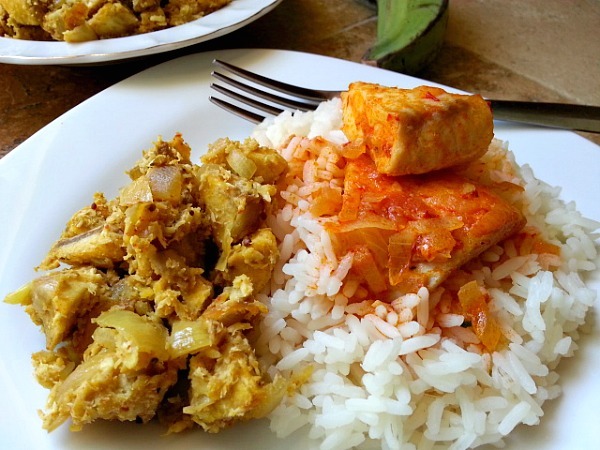 Delicious and original dish here! I love to use green bananas in my soup. My husband is from Jamaica and they eat green bananas with Ackee and Salt fish. And with Breadfruit and pork. That is where I first learned about green bananas. There are so many different ways to use it, but your way I have never tried. I’m going to try your recipe it looks like it will be very tasty! Omigosh, that looks SO good! Can’t wait to try your recipes! Thanks Renate…I hope you do try it :-). This looks really delicious! I also really enjoyed learning a little bit about Kerala. I love Cooking with them as well my family is West Indian !